While it's happened very few times, a big time perk of running this website is when someone gets in touch with me about a record I'm looking for that I can't find. Have a gander at my wants list some time. It's not completely up to date, but maybe you've got something on there that I'm looking for. 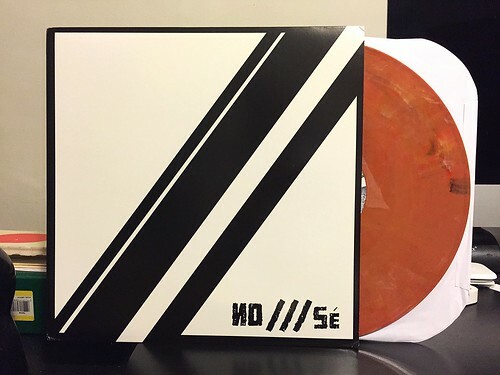 When I originally wrote about the first ИO​/​/​/​sé record I wasn't able to track down the colored vinyl version. I did manage to find the much more difficult to obtain test pressing of it however. I had mentioned that I don't collect test pressings and would happily trade it away for the normal colored vinyl version. Anyway, this record is still every bit as great as it was the moment I first heard it. ИO​/​/​/​sé manages to come off as a weird concoction of The Marked Men, Leatherface and Hot Snakes. Those are some pretty top tier comparison points, but ИO​/​/​/​sé really does manage to incorporate elements of each to create some amazing music. If you missed this album the first time around, I cannot recommend it highly enough. They have a newer album that recently came out and it is also great, but their debut is in rarified territory. It's just that good.